Casio announced an all-new G-Shock S Series watch to be released in Asia. The GMA-S120 is a smaller version of the G-Shock GA-120. The first series for this new model is the GMA-S120MF featuring monotone matte colors with metallic-accented faces for a simple yet stylish look. The new models include the GMA-S120MF-1A (black), GMA-S120MF-2A (light blue), GMA-S120MF-4A (light pink with rose gold face), GMA-S120MF-7A1 (white with silver face), and GMA-S120MF-7A2 (white with rose gold face). 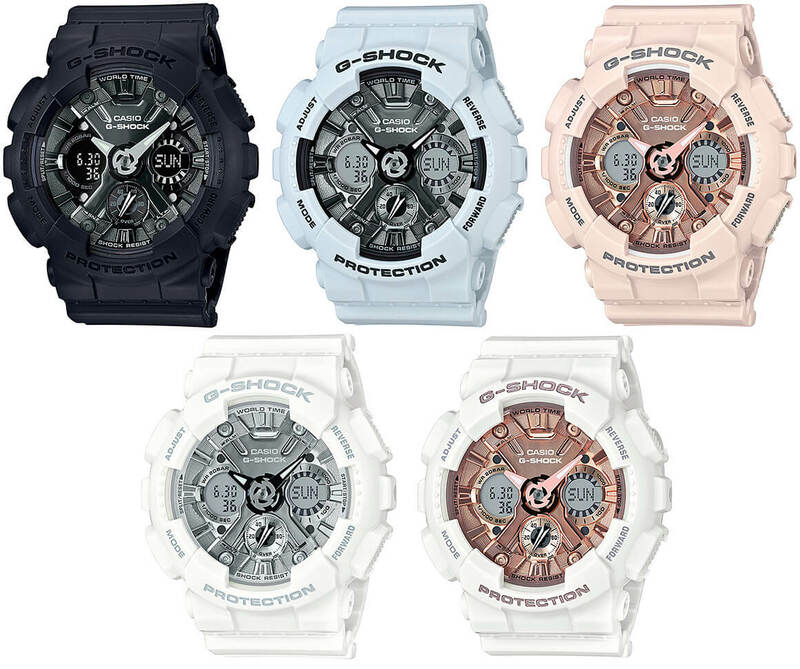 The G-Shock S Series is designed for the smaller wrists of women, but some of these models have a unisex look that would be a good option for men and boys who find the GA-1XX watches too large. The GMA-S120 features shock resistance, 200-meter water resistance, auto LED light with afterglow, world time (48 cities + UTC), 1/1000 second stopwatch, 24-hour countdown timer, 5 daily alarms with 1 snooze alarm, hourly time signal, full auto calendar, 12/24 hour format, and estimated 3-year battery life. Update: Casio America announced all five models (the GMAS120MF-1A, GMAS120MF-2A, GMAS120MF-4A, GMAS120MF-7A1, and GMAS120MF-7A2) for a March release. The list price is $130 USD each. Do you know if the GMA-S120MF-1A will be released in Australia? Or Asia only? I would expect a wide release but I’m not sure. I’ll update the post if I hear anything.